Today the Roman Forum (also in English the Latin name Forum Romanum is used) is by far the most important and largest excavation site in Rome. The Palatine also belongs to the fenced area near the Colosseum. It is one of the seven hills of ancient Rome. Here the city of Rome is said to have been founded according to legend. The Roman Forum was probably the oldest inhabited area in ancient Rome. If you want to have a look at the whole area, you should have a fit day. Kilometre-long paths lead through the excavation site. There is a lot to see, including a museum, gardens and much more. You get lost especially on the Palatine fast, we searched for half an hour of the way from the Palatine back to the Roman Forum despite Google Maps on the smartphone. It is a good idea to read a good guidebook about the excavations beforehand and to have an appropriate book with you. The more you know about the things you see, the more interesting it is. 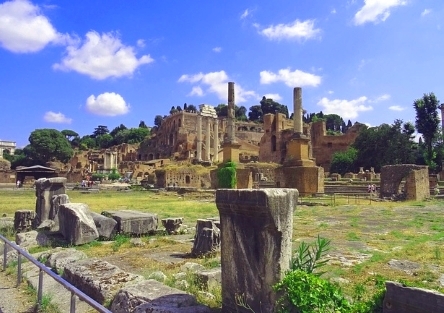 In principle, the Forum Romanum was the central square in ancient Rome and the centre of the city. Right next to the Forum (town square) were many important buildings of the ancient city of Rome. The hill Palatine was a few hundred meters away. At that time, as today, you have to cover a height of approximately 50 metres in order to get from the Roman Forum to the Palatine. Romulus is said to have founded the city of Rome on the Palatine after winning a competition against his Revalen Remus. According to many ancient traditions this was in the year 753 B.C., some old data are even more exact. They speak of April 21 in 753 BC. How much of the history was and how much legend is still unclear today. From the Palatin, you also have a good view to the Circus Maximus. In ancient Rome this was a racecourse for car races. Unfortunately not much of the Circus Maximus is preserved. Worth seeing is the museum on the Palatin. There is also a toilet. The entrance to the museum is free or included in the entrance fee of the whole excavations. We liked the Farnesian gardens, for instance between the Roman Forum and the Palatine. The Farnesian Gardens could have been the first botanical garden in the world. The entrance most used by tourists is only about 300 meters away from the Colosseum. In front of the Colosseum is a subway station called Colosseo (Metro Line B). The area of the excavation between Palatine and Roman Forum is very large, also in other places there are entrances and exits. You can also take the tram line 30 to Roman Forum. There is only one combination ticket for the Colosseum, Palatine Hill and Roman Forum. It costs 12 Euro, children under 18 do not have to pay admission. For EU citizens under 26, there is a reduced entrance fee of 7.50 for all three sights. The ticket is valid for 2 days, i.e. you can visit the Colosseum on one day and the Palatine and Roman Forum on the other. The excavation is visited daily by more than 10,000 people. It is open every day of the week. The Roman Forum is only closed on a few public holidays. The opening times are from 8:30 daily. The excavation site closes sooner or later, depending when it gets dark. In the summer until the end of August is open until 19:15, in some months in winter only until 16:30. In Italian the ancient square is the „Foro Romano“, in the international tourist language English it is called „Roman Forum“. 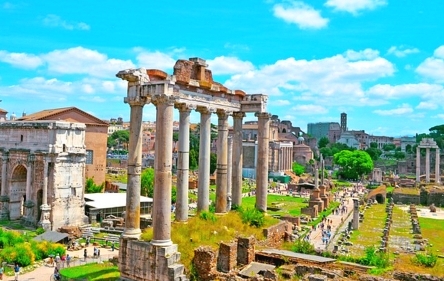 The old Latin name is „Forum Romanum“. The hill Palatine is in Italian the Palatino, in English the Palatine Hill. The ancient Romans called the small mountain „Mons Palatinus“.